UK CZT Chrissie Frampton shares her Anibal tangle with us today. This tangle pattern is called Anibal which was inspired by a visit to Plaza de España in Seville. 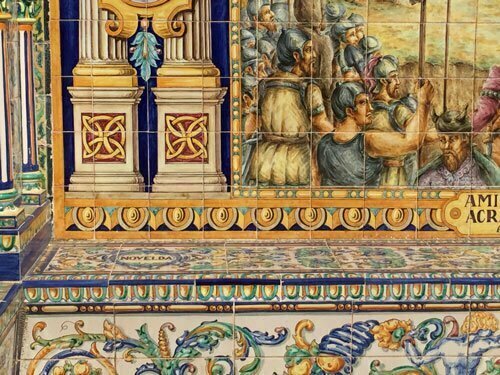 Anibal Gonzalez was the architect who designed the featured tiled Alcoves of the Province’s of Spain. Spanish visitors choose to have their photos taken by their own Province’s alcove. 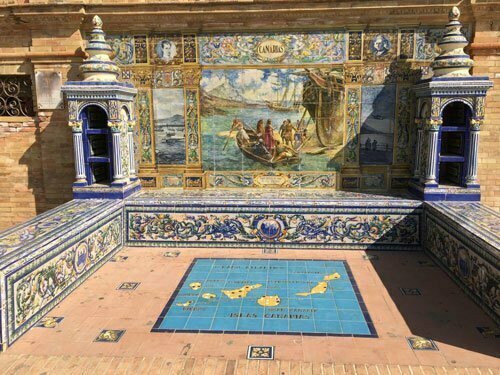 “to showcase Spain’s industry and technology exhibits … it is a landmark example of the Regionalism Architecture, mixing elements of the Renaissance Revival and Moorish Revival (Neo-Mudéjar) styles of Spanish architecture. 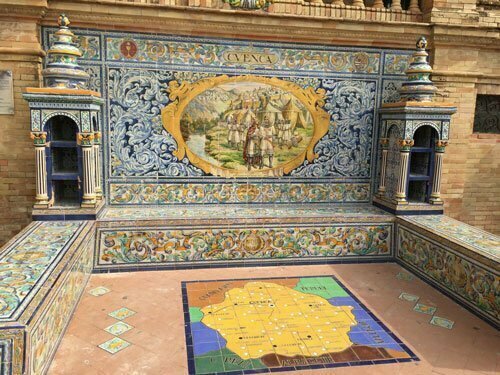 … Today the Plaza de España mainly consists of Government buildings. Well worth checking out the panoramic photos in the Wikipedia article, it certainly does look extra-planetary! Chrissie illustrates the step-by-step instructions for drawing Anibal below where she explores several variations in her lovely Zentangle square tiles and Zendala tiles. 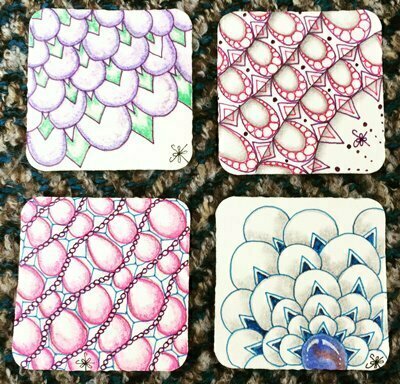 In this image of her Zentangle-inspired tiles (ZIA), Chrissie explores Anibal and some wide-ranging variations in color. Lovely pictures and a lovely new tangle! What a great versatile pattern! I can see this looking lacy and light or ponderous and architectural or even organic as in Chrissie’s final tile on the page. I can’t wait to see how the Zentangle community plays with this one! This is such an entertaining tangle..It’s fun taking pictures when you travel and then deconstructing ones that lend their image to a new tangle ! I see a lot of fun potential with this tangle! In the city I used to live in for the first 64 1/2 years of my life, Christmas is such a big deal for most of the residents that all the stores, including Walmart, start setting up their Christmas stuff before the end of July! The two crafts stores up there, Michael’s (how I miss that place!!) and JoAnne’s, put up Christmas items around July 5th, only barely waiting for the 4th to be over. 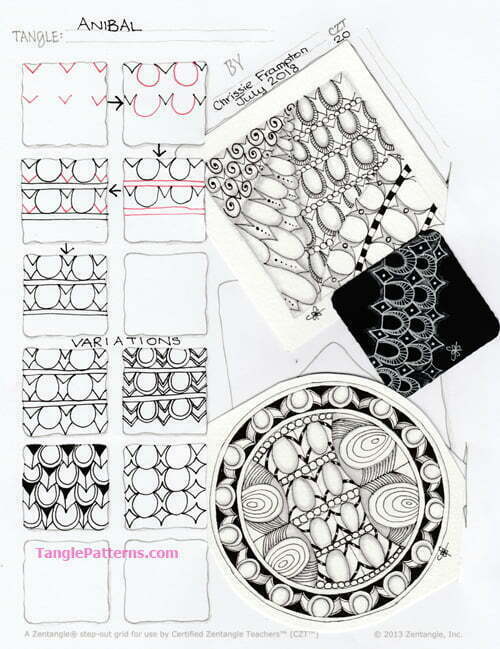 Thank you so much for including Anibal on Tangle Patterns Linda. Apologies for the delay but (surprise surprise) we have been travelling. This time a cruise to Greenland and Iceland – lots of beautiful scenery but not so many patterns this time.